Sometimes, a high power solution can be overkill for the task at hand. 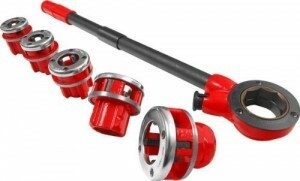 If you only have a small amount of pipe to thread, are working on a small scale budget for some domestic work, or would rather a solution that doesn’t require any of the formal powered hire insurances, then a manual threader would suit your needs. It works via a simple ratchet action, locking against the pipe to cut the thread; this means that you’ll have no trouble working with pipes between 1/2 and inch and 2 inches. No electricity? No problem. If you’re working on a build where there’s limited access to power for whatever reason, the manual ratchet threader will allow you to continue working in whatever scenario.